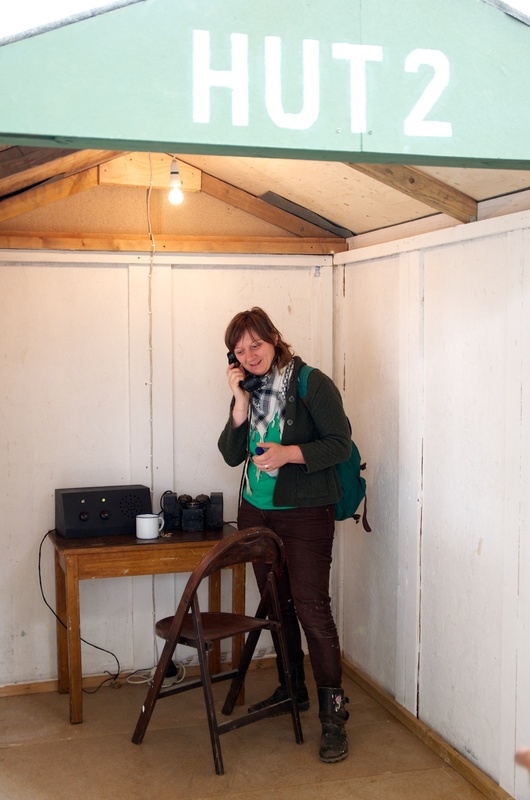 I got talking to Jonathan Hogg, from Output Arts, a small arts collective that has been making multisensory art installations since late 2009. This being the centenary year, they decided to take Turing’s work at Bletchley Park as a starting point for a commission they were given earlier in the year. And they used a Raspberry Pi to do it. Here are the results, and some commentary from Jonathan on the project. I very much hope we’ll be able to go and see I have a message for you… when it’s next on display; hearing what our little computer was doing in this piece made the hairs on the back of my neck prickle, and I really look forward to seeing what Output Arts do with their next Raspberry Pi. Earlier in the summer, Output Arts won a commission to work with Bletchley Park and Milton Keynes Museum to make an artwork on the theme of “communication” to be shown as part of the Milton Keynes Fringe Festival. Inspired by the work of Alan Turing, we decided to make a piece based on the Delilah speech scrambling system designed by Turing towards the end of the Second World War. The original design of the Delilah system consisted of a pseudo-random number generator and a modulo adder implemented entirely in analogue using valves. Working from the original technical report held at the National Archives in Kew, we wrote a digital simulation of the algorithms in a combination of Python, Cython and NumPy, tuned to run on a Raspberry Pi in realtime. 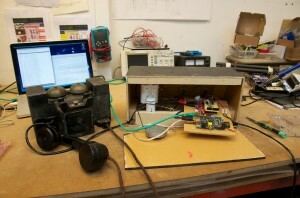 The equipment of the piece consisted of a box with two knobs, two indicator lights and a hidden motion sensor. This was styled to try and make it look like an old piece of equipment, and was connected to an original WWII military field telephone loaned to us by Milton Keynes Museum. 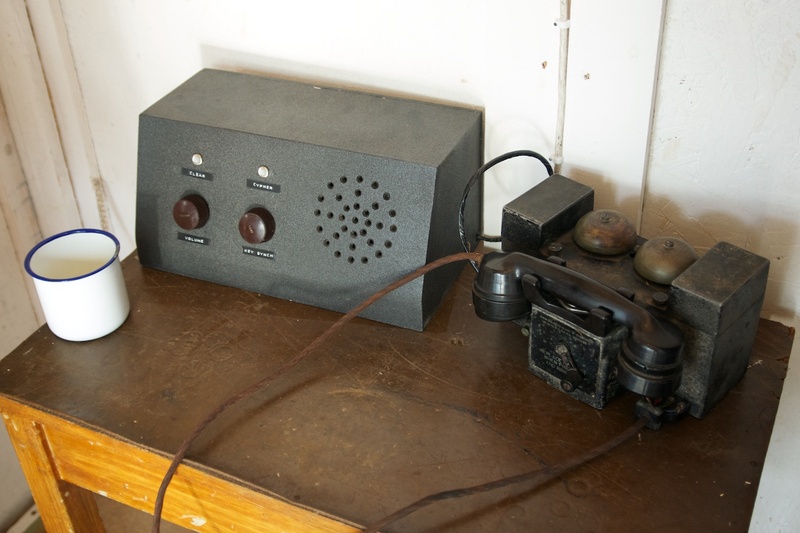 The equipment sat on an old table – also on loan from the museum – and this was placed within a small wooden hut, painted up to look something like a code-breaker hut that might have been found at Bletchley Park during the war. When the box senses motion, it makes the phone ring to encourage participants to lift the receiver. 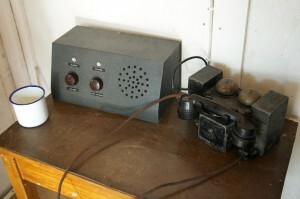 Picking up the receiver activates the system. We collected messages at Milton Keynes museum and Bletchley Park that were recorded and then scrambled using the Delilah simulation. These scrambled messages were stored as audio files on the SD card of the Pi and then descrambled for listening. The process was deliberately interfered with so that the messages being listened to slowly degrade in quality until they become just noise. The two knobs on the box control the volume of playback and one of the parameters of the descrambling, providing the participant with some sense of control over the listening process – although not enough to put off the eventual destruction of the message. 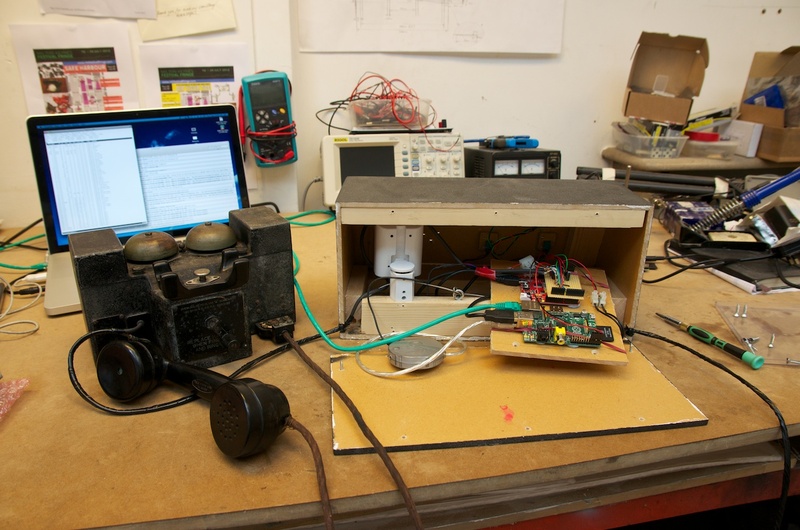 An Arduino board connected to the Raspberry Pi by USB was used to interface with the knobs, lights and motion sensor, and the hook switch and ringer of the telephone; a small circuit connected to the Arduino switches 12V power for the ringer. We also used a USB audio output device as we experienced some distortion of the built-in audio output of the Raspberry Pi under load. This is the first time we’ve used a RaspberryPi in an artwork, although we have been using Arduino boards for years. It’s been really exciting to be able to try out a Raspberry Pi and has opened up a lot of new possibilities in what we can do in small embedded pieces. The artwork was shown from 19th to 29th July in the centre of Milton Keynes, and we are hoping to be able to show it again sometime soon, either in London or back in Milton Keynes. Output Arts are very grateful to the staff and volunteers at Bletchley Park and Milton Keynes Museum for their help with the piece. Great write-up, and awesome use of an embedded Pi! Thanks for the read! The Raspberry Pi looks like it’s running with no USB power supply? 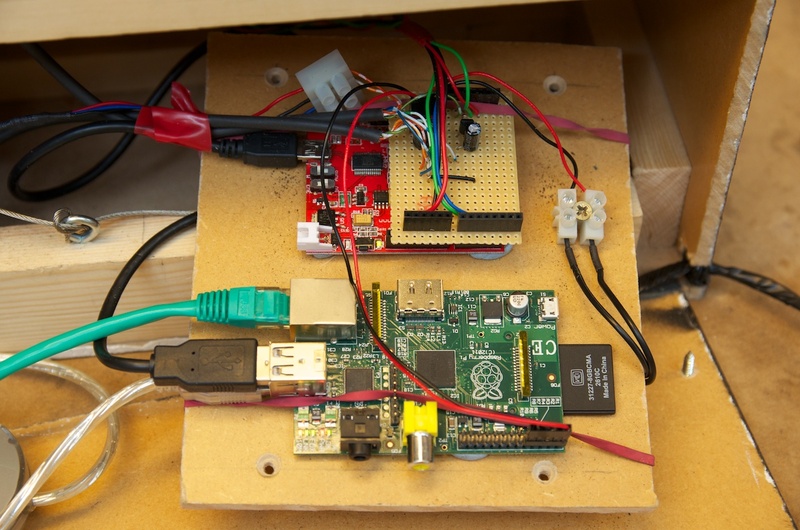 The Pi is being powered by the red & black wires fed into the connector on the GPIO port. There’s a couple of pins there which you can use to feed 5v directly into the Pi’s system, as opposed to using a micro-USB connector. You just gotta be a bit more careful with that power supply line, because I believe it bypasses the power regulators between the micro-USB port and the rest of the Pi. Yes indeed! We powered the Pi directly from the GPIO header using a TSR-1 5V DC-DC converter to provide a stable 5V source (these are awesome little things by the way!). The Arduino is then powered from the USB on the Pi. The main supply into the box is 12V and it was easier to do it this way than rig up a 12V USB supply. Would it be possible to upload a copy of the message so we can hear what it sounded like? Hi Liz, wow, it must be a great feeling to see your creation being used in the creations of others. I thought i would take this opportunity to run something by you. I know that the primary purpose of your work has been to make something educational and affordable for the next generation of learners and tinkerers. From the Internet chatter,it seems your project has been massively successful thus far. I would like to ask you some questions regarding an offshoot of your work with the pi. The pi seems to have inspired an array of minimalist mini pcs ranging from boards like odroid x to barebone units like the mk802. While most have faster processors and more ram, most seem to have been designed keeping production and not use in mind. I would like to inquire whether the originals (you guys) have any plans to make a soured up pi? I have a plan for how you can do this if volume etc are the concern preventing you from doing this. 1. You can use a kickstarter model to rack up the preorders required to get the volume discounts on production. 2.Since you have already handled one product you have the experience to produce the next. 3. start with a baseline config of processor,gpu,ram and let everyone know the minimum number of units for which you need a pledge. 4. The baseline can be made from a poll from your current users and a base pledge price can be set accordingly after discussing it with your manufacturing partners. 6. Keep the turnaround time low (3 months post funding) by going with a modified version of your existing design and your existing suppliers. 7. Given what you have already accomplished you are not subject to one of the most important questions of this model: can we trust these people to deliver? 8. It doesn’t need to conflict with your no profit model.hey you can charge us cost or you can charge us cost + a margin. The margin can be used to subsidise purchase of the product by educational institutions. Eg. It costs $150 to produce, you charge the pledger $175 and then offer it at $125 to educational institutes or offer the original rpi at $0 to them. 9. We get a high quality product which is designed to be somewhat forward looking both in terms of specs and tinkerability and it is produced with a known price in mind so it won’t be out of reach. Anyway,I have been thinking about this for a while so I thought I would write this out. Thank you. Doesn’t really fit with our plans at the moment, but it’s very kind of you to share your thoughts! The raspi did not inspire an array of low-cost devices. The beagleboard and the pandaboard have been around for years. I spent 2-3 entire weeks solely researching and writing a 20-page long assignment regarding the subject “Breaking the Enigma-code” in high school. It sure is an amazing story and I was totally fascinated by Bletchley Park and especially Alan Turing. I really hope that I will come by this place one day. Thanks for refreshing this to me! Imagine what Alan Turing could have done if he had a Raspberry Pi?! Yes indeed, haha :-) I’m sure it could have replaced some of the “bombes” wasting up entire rooms. How topical, bearing in mind the first Milton Keynes Raspberry Jam is happening this Sunday at the Computer Museum, which is part of the Bletchley Park complex. I had been invited to come along to the Jam to show the piece and talk about it, but I will be away unfortunately. Hopefully I can attend another one sometime soon. I agree! Everyone should immediately stop doing anything with their Raspberry Pis until all teething problems are sorted out and every schoolchild in the world can program in machine code. This blog just encourages the likes of computing, creativity, art, science, curiosity and outright fun. It’s a disgrace. You should be ashamed. Give it a rest. This is being thoroughly covered in the forums – this comments section is an entirely inappropriate place to concern troll. It’s a post about someone (not the Foundation) doing something good – it’s not an opportunity for you to whinge about the USB issue. No more trolling please. I love this sort of stuff. Looks as if things weren’t so cushy at Bletchly, even if it was the grounds of a mansion! This exhibit seems to work on so many levels — capturing the atmosphere and urgency of wartime cryptanalysis, getting the visitor to interact, to name two — congratulations! BTW, Liz, you mentioned Spectrum…the Spectrum I remember from my childhood dates back to 1967, so its 45th anniversary will be this year.